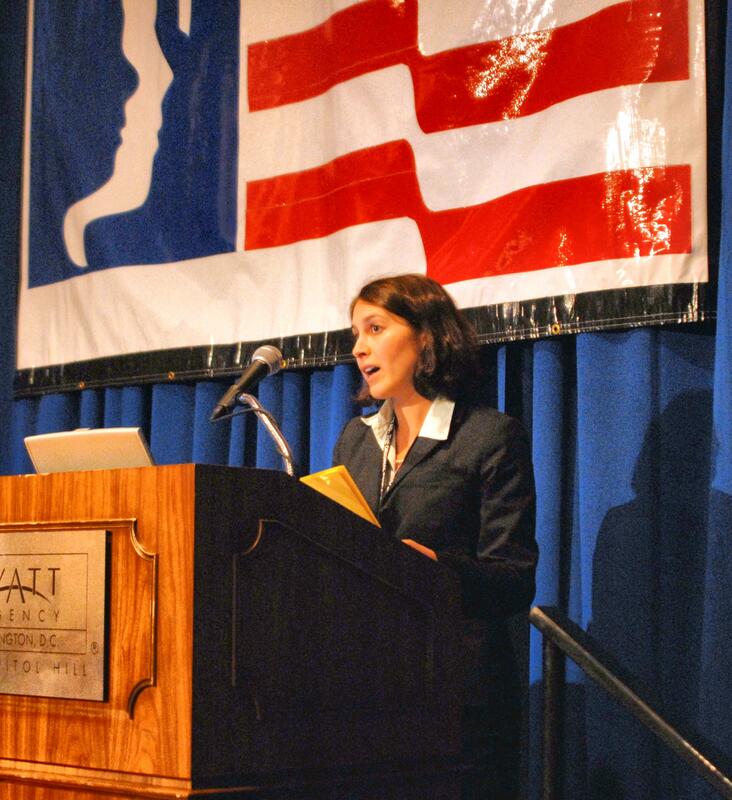 Jocelyn Bissonnette speaks at a NAFIS conference. It’s been more than a year, but Lovable Lobbyist is back with a special Valentine’s Day Lovable Lobbyist edition! With education reauthorization being worked on this year, we wanted to introduce you to one of the people that will be helping to make a difference in the lives of students across the country. Meet Jocelyn Bissonnette, the Director of Government Affairs with the National Association of Federally Impacted Schools, a non-profit that works to ensure that students across the country get the education they deserve, particularly those from military families. Do you have a personal connection to the nonprofit you work for? Education has long been a passion of mine. I studied economics and political science in college, but my interest in federal education policy was piqued by a course on social mobility and social change and reinforced through my participation in a literacy-focused tutoring program. I spent a summer teaching middle school in Providence, RI and while that was an incredible experience, I realized that although I wanted to pursue my interests in education, teaching was not for me. I’m fortunate to work for an organization that advocates for and protects the interests of school districts. What positive things Online Casino would you like people to know about lobbying and advocacy? My organization lobbies on Impact Aid – an education program that reimburses school districts for the lost local tax revenue associated with the federal presence in their district (anything from military installations to Native American reservations to national parks). I see myself as an advocate: the voice of these school districts on Capitol Hill, protecting their interests and ensuring their voices are represented. NAFIS provides district-specific analysis and legislative expertise vital to the policy-making process. Our members are busy running school districts, and my organization exists to monitor congressional activities on their behalf. What can people do to get involved in advocacy activities with Impact Aid schools? NAFIS has a website (www.nafisdc.org) and a Facebook page where we post advocacy activities and action alerts. You can donate to the Federally Impacted Schools Educational Foundation, which provides workshops and training to school personnel. NAFIS also works with the Committee for Education Funding, a broad coalition of educational groups (www.cef.org). I love cooking, cheering on New England sports teams, and seeing shows at local theatres in DC and Northern Virginia. Because of my Armenian heritage, I also enjoy discussing Armenian history and culture. This entry was posted on Tuesday, February 14th, 2012 at 8:01 am and is filed under Just for Fun, Lovable Lobbyists by Vbhotla. You can follow any responses to this entry through the RSS 2.0 feed. Both comments and pings are currently closed.